The New Zealand Rugby Union has pulled the plug on the 2010 womens rugby NPC in move that has been slammed by current and former Black Ferns. The decision comes in a crucial year for the womens game in New Zealand as the Black Ferns will travel to London to defend their World Cup crown this summer. New Zealands squad captain Melissa Ruscoe (pictured) said she was gutted by the decision. "I'm gutted, I really am. It's a bit of a kick in the guts and it's going to make it extremely difficult for our players to perform at that international level on a pretty short buildup,"
Former Black Ferns captain Farah Palmer also slammed the decision saying it could effectively kill the game in New Zealand. "It's very disappointing. I know the NZRU was under pressure to make budget cuts but I know from past experience that when a competition is cut it is hard to get it on the agenda again. In the long-term it will kill women's rugby." The womens NPC in New Zealand is the provincial competition traditionally dominated by Auckland, in which the best players in the country play. The competition had been previously cut from two divisions to one. 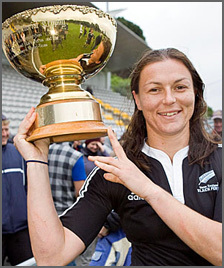 Auckland coach and former Black Fern Davida White said: "This decision will be the end of women's rugby. Simple as that. The girls will play league and netball now. There's no incentive to play for your clubs, so the clubs will die. "The NZRU should know what is going to happen. They only need to look at what happened in the areas affected when they cut the second division. Women's rugby died there." NZRU general manager of professional rugby, Neil Sorensen said the women's provincial competition was not the only victim of necessary cost-cutting. "The central funding for the women's competition has been removed for 2010, along with a bunch of other initiatives that we've cut for 2010, like the Junior All Blacks and participation in the Pacific Nations Cup," Sorensen said.